In the mean time, I did manage to get a little sewing in today, too. The block above is for the August birthday girl for Kate's 2nd Birthday Block swap. 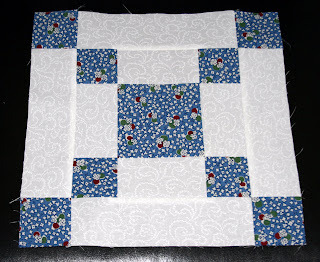 She asked for the Pennsylvania Block made up in 1930's fabrics with a white-on-white background. I also started cutting out some fabrics for a quilt for me. Hopefully I will have progress to show you on that soon. i can't wait to see how the quilt progresses. i have been too lazy to do much quilting these days... maybe you'll inspire me!